Senior goalkeeper Zak Allen saves a free kick. Northwestern will look to play a complete game and build momentum as it hosts Rutgers Friday. 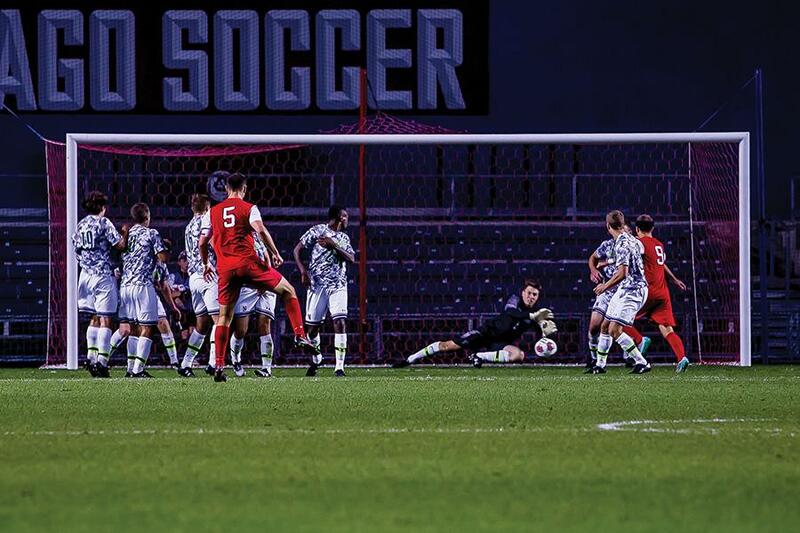 As Northwestern’s season approaches its final third, the Wildcats return to Toyota Park this weekend for the first game of an important three-game home stand. NU (5-5-1, 2-2-0 Big Ten) faces a hot Rutgers team that comes in having won its past three games. The Scarlet Knights (7-4-1, 2-3-0 Big Ten) are led by reigning NSCAA and two-time Big Ten Player of the Week Jason Wright. Wright, only a sophomore, already has 10 goals on the year. He headlines an impressive offensive unit for Rutgers, which has scored four or more goals four times this season. This presents an interesting challenge for the Cats, who fell behind early in their recent defeat to SIU-Edwardsville. NU’s win over Maryland on Oct. 2 was the only time so far this season it won after conceding first. The need for the Cats to play hard from the opening whistle was repeatedly harped on by coach Tim Lenahan. However, even in NU’s recent defeat to the Cougars, there were positives. Cats junior forward Mike Roberge netted his first goal of the season, which exemplifies the diverse nature of NU’s offensive production. Eight different NU players have found the back of the net so far this season. Roberge emphasized that NU needs to continue being aggressive and opportunistic on the offensive end. “You can’t give up on a possession, especially in the attacking third,” he said. Additionally, despite the team’s recent winning streak coming to an end, there did not appear to be a noticeable drop in team confidence following Thursday afternoon’s practice. The Cats remain in the thick of the Big Ten race, only two points behind conference leader Maryland. Echoing a sentiment expressed by many NU players throughout the season, senior forward Joey Calistri believes the team is not in a bad place. “We didn’t play our best for the first half against SIU. But we know what we need to do, and that’s play a complete game,” he said. This refrain, “play a complete game,” has been repeated throughout the year by coaches and players alike. The Cats are confident in the team they have, but whether this confidence will be translated into Big Ten regular season success is still in question. Facing the difficult schedule NU has faced so far, it is only fitting that the Cats last home stand will feature three teams with winning records: first Rutgers, then Notre Dame and Michigan State next weekend. Lenahan is not thinking that far ahead though, with his focus naturally centered on the game at hand. “Clearly there’s some impressive teams, but we will be taking it one game at a time,” he said. The Cats kick off against the Scarlet Knights on Friday at 7 p.m. at Toyota Park.